What Is The Best Lock I Can Get For My Storage Unit? The lock you put on your storage unit door is in many ways the final frontier towards getting to whatever you have stored in the storage unit near you. After the rigorous security arrangements common to the self storage facility, such as CCTV, restricted access, and tracking who is on the premises, you don’t want to make things easy for anybody who slips through the net. Getting a solid lock on the front of the unit is the best move you can make, and one you won’t be kicking yourself for later. The first thing you need to do is see what type of lock can be placed on the unit. Measure the width of the latch so that you know what dimensions the lock ought to be for maximum effectiveness. Bigger is better, as you want this lock to be as tough and difficult to crack as possible. Also bear in mind where you are located, if outdoors then there is no option but to use a durable steel lock that can withstand whatever weather conditions may be present, and its fairly good practice indoors too. So which locks should you be going for then? The first idea that anyone might have in this situation is to investigate padlocks. However, they are in fact a rather casual solution that might be good for short term situations, for example locking up non-valuables in a public storage locker, but for keeping your items secure long term in a remote area they are highly risky. It is relatively easy to force or cut through the bar, pick the lock, or even obtain generic keys for that manufacturer. So it really isn’t a very good arrangement for keeping your valuables safe in the long term. 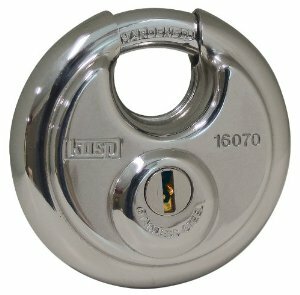 The more secure variant you should be considering is the disc lock, which has become the standard for self storage unit these days and is pictured above. You will see that the bar of the lock is very short and will be concealed almost entirely within the latch, thus being very difficult to cut or bash out. The locks are a lot harder to pick too, and since metalworking tools and a lot of time and noise are the minimal requirement to break into them, easier pickings may be found elsewhere. There are other locks you may come across in your search, such as the standard deadlock that you might have on your front door. If this is achievable for you then it isn’t a bad option. There are also locks that require a number combination to be entered in, rather than using a key. These are very handy for businesses that might have several employees requiring access and not wanting the hassle of delegating keys here and there. A good idea in principle, but the locks tend to be made less sturdier than your common disc lock, so apply with caution. We can see therefore that locks are not one and the same, and investing in a good one will ramp up the chances of keeping your goods away from intruders. Another thing to consider, the better your lock, the better the insurance deal you will be eligible for on your storage unit, so that is an extra factor worth bearing in mind.